REAL ESTATE REBATES ARE NOW LEGAL AND AVAILABLE IN 40 STATES – THE U.S. DEPARTMENT OF JUSTICE WOULD LIKE TO SEE THEM AVAILABLE IN ALL 50! A Buyers Agent Commission Split in the form of Real Estate Rebate Offers is now legal and available in at least 40 States. However, many Realtors choose not to provide Real Estate Rebates or even MLS Listing Discounts because they already Split their Commission with their Brokers. However Real Estate Brokers and Realtors that earn 100% of their commissions are making Real Estate Rebate Offers to better compete for market share. “Respectable Agents do not give Rebates” –NONSENSE! All Buyer Agents at The Real Estate Savings Center are very Highly Rated and they have at least 5-years of professional service experience. Many of our Network Realtors are Companies Owners and Brokers that can afford to make Real Estate Rebate Offers as opposed to those Agents who prefer the old, traditional “one-fee-fits-all” way of doing business. “You wouldn’t ask for a Rebate from your Doctor or Attorney would you?” PROBABLY NOT, but Real Estate Agent Education and Licensing costs are only hundreds of dollars and not many tens of thousands of dollars for other professionals. There is nothing wrong with Agents trying to protect their livelihood, but comparing their professional skill to those of an Attorney or Doctor is a big stretch. “What would you rather have a a Buyers Agent that can help you negotiate $10,000 in real estate savings or a Buyer’s Agent that offers a $4,000 rebate?” TODAY YOUR CAN HAVE BOTH by choosing a Buyers Agents at the Real Estate Savings Center who will work as your Advocate to help you negotiate the best deal, plus you can compare Real Estate Rebate Offers if they are available in your hometown or your destination city. “We don’t provide Rebates since our services are Free” THIS IS MISLEADING since the Seller has typically already factored in both the Buyer and Seller Commissions in the price they are asking the Buyer to pay. 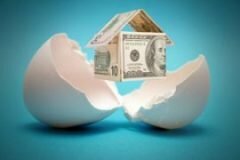 The fact is, it is the Buyer’s Money (or their Mortgage Loan) that is funding the deal to help the Seller afford the Commissions and keep more of their equity. So, since all Realtor fees are negotiable, why not look for a Realtors that do negotiate part of the Buyer’s Commission back. After all, if you are a Buyer who has done a lot of your own research and home searching, don’t you think you deserve it? “You get what you pay for, and you can’t have Full Service plus Savings” AGAIN, NONSENSE! Compare what the REALTORS® at The Real Estate Savings Center are willing to offer you, and then you decide. Today the Internet can save Consumers and Realtors a lot of time and money. Some Realtors are happy to share their savings with you, particularly if you are already doing some of the work. So instead of “you get what you pay for”, with The Real Estate Savings Center, it is like “you get paid for what you are doing”. REAL ESTATE REBATE OFFERS ARE CURRENTLY LEGAL IN ALL STATES EXCEPT ALABAMA, ALASKA, IOWA, KANSAS, LOUISIANA, MISSOURI, MISSISSIPPI, OKLAHOMA, OREGON, and TENNESSEE.